Pain, however, can be the least of the worries for some dogs. Bee stings may lead to a severe, life-threatening allergic reaction that can lead to shock and even death. Here’s what you need to know when curiosity stings the pet. Curious dogs are often stung on the face or in the mouth, resulting in a flurry of yelping and pawing at the muzzle or other affected areas. 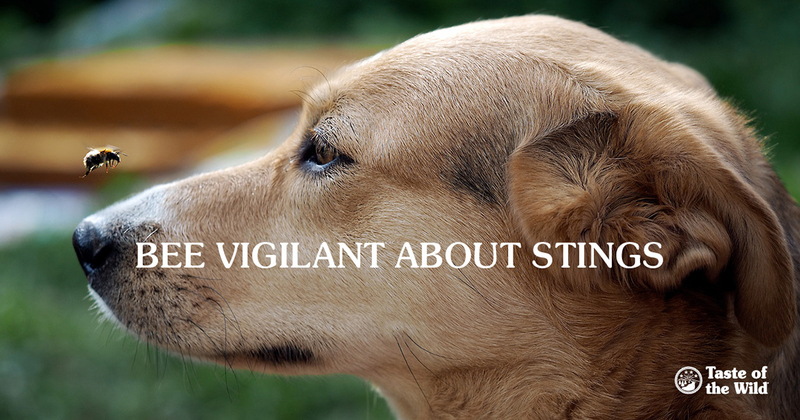 Other signs can range from mild to severe, depending on the location of the sting, the number of stings, and if your dog has an allergy to the bee venom. Lucky dogs will get by with just a local reaction: redness, mild swelling, heat and potentially itching at the sting site. This usually goes away on its own within a day or so. Signs of a potentially serious reaction usually develop within 10 to 30 minutes of the sting and include swelling of the eyes and face, which can lead to difficulty breathing. Other signs include drooling, vomiting, diarrhea, weakness and collapsing. Serious signs can develop quickly, so it’s important to watch your dog and be prepared to seek veterinary care immediately. In rare instances, these signs may occur 12 to 14 hours after the sting. Are all stings the same? Not exactly. Bees have a barbed stinger that detaches from the bee and remains in the pet’s skin. For several minutes after the sting, the venom sac on the stinger can continue to pulsate, injecting venom into the area. Wasps, hornets and yellow jackets (which are specific types of wasps), however, don’t have barbed stingers. They retain theirs and can sting multiple times. This can be especially problematic if your dog uncovers a wasp nest in the ground, because the stings can increase exponentially in number. For bee stings, if you can find the implanted stinger, remove it by scraping a credit card along the skin. Avoid using tweezers, because you could inadvertently squeeze the venom sac, forcing more venom into the skin. For both types of sting, help reduce swelling by applying a cool compress to the area, made by wrapping a towel around ice or a bag of frozen vegetables. You can also mix baking soda with water to create a paste that can be applied to the skin to help neutralize the acidic venom. If possible, bandage the area to prevent your dog from licking the paste. Do not give your dog any medication without consulting your veterinarian first. If you’re concerned about your pet, contact your veterinarian for advice. If your dog experiences more severe signs, such as facial swelling or difficulty breathing, it’s important to get to the veterinarian as soon as possible. Depending on your dog’s condition, your pet may need to be hospitalized and the veterinarian may administer medications such as antihistamines, steroids and epinephrine as well as intravenous fluids and oxygen. For pets that have a history of severe allergic reactions to bee stings, your veterinarian may recommend keeping an EpiPen (an epinephrine automatic injector) on hand. However, an EpiPen must be properly dosed to the size of your pet. Although the EpiPen Jr. delivers a smaller dose, it may still be too much for small dogs and cats. Talk to your veterinarian about options for your pet.